Our plumbing neatly disposes of wet refuse with minimum fuss and maximum efficiency. But, when something goes wrong that we may need to boldly go where no man has gone before. Think of a plumbing camera as a plumbing professional’s way of voyaging from a cleanout, kitchen or bathroom down to the city sewer line, with a clear view all along the way. Today we’re going to talk about some reasons a plumbing camera can be a useful tool. If a homeowner suddenly has a weirdly high water bill or an oasis of weeds sprouts in their desert landscape in the middle of summer, or their water pressure becomes dismal, these are signs your plumbing may have a leak. A plumbing camera is a non-invasive way of pinpointing the exact problem and location. The camera will save time, effort and money. Using the camera equipment can help a plumber determine the precise location of the problem. When the clock is ticking, this is the fastest, most straightforward method. Also, people are reluctant to digging up a wide swath of their landscaping dug up when there is a quicker, cleaner way. 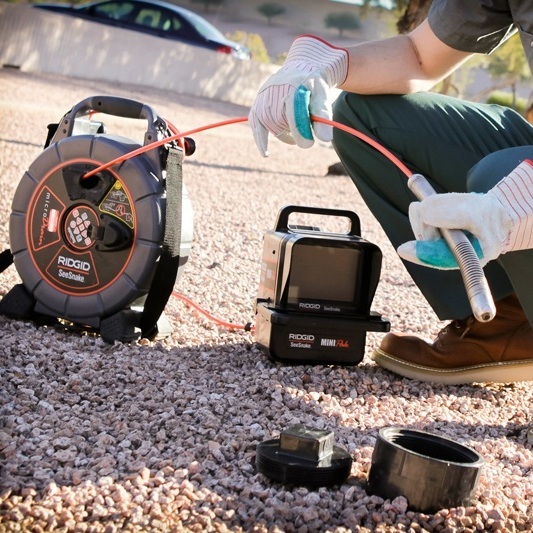 Efficient management of a plumber's time and a clear view of problem areas are the main reasons to use a drain inspection camera. It’s hard to believe how far state-of-the-art plumbing has become, but there are far better things for a homeowner to spend their money on than having workers tear up their beautiful landscape to search for a plumbing leak.